A research partnership between the University of Southampton’s world-renowned Institute of Sound and Vibration Research (ISVR) and Halyard Ltd, Europe’s leading manufacturer of marine exhaust systems, has resulted in Halyard receiving its second Queen’s Award for Enterprise in the Innovation category. 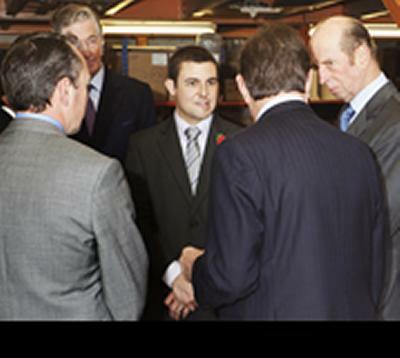 HRH the Duke of Kent made a special visit to Halyard’s headquarters in Salisbury to present the company with its Award. The Duke of Kent presented Halyard with the prestigious award in recognition of its continuous dedication to innovation. Since winning its last Queen’s Award in 2006, Halyard, with support from ISVR, has developed a number of significant new products to provide strategic solutions for the silencing of larger marine engines and generators. New products include the company’s patented watercooled Helmholtz resonator silencer, designed in conjunction with ISVR. ISVR consulting is the consultancy unit of the Institute of Sound and Vibration Research, which is part of the University of Southampton. It offers up-to-date expertise and technical assistance to SMEs across a wide range of areas involving sound and vibration engineering, which is uniquely informed by 47 years of research within ISVR. ISVR Consulting undertakes commercial consultancy work and contract research in acoustics, noise, vibration, speech intelligibility, hearing and audio communication, vehicle dynamics and shock analysis for Industry, Businesses, Government Departments and Agencies, Local Authorities, other organisations and individuals.